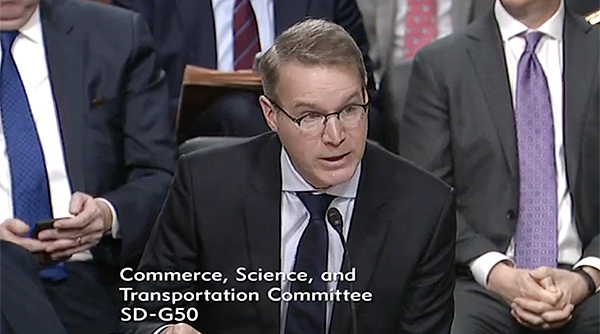 American Trucking Associations President Chris Spear is scheduled to appear before the Senate Commerce Committee on Feb. 13. Spear is among the transportation executives set to outline for the panel myriad concerns within the freight industry about the country’s infrastructure. The trucking industry, for instance, has sounded the alarm about the impact that traffic congestion has on the flow of freight. Witnesses joining Spear on Feb. 13 will include William Friedman, chairman of the American Association of Port Authorities; Ian Jefferies, president of the Association of American Railroads; Matthew Polka, president of the American Cable Association; and Larry Willis, president of the Transportation Trades Department. TOP BOTTLENECKS: ATRI's Top 100 truck congestion points. After the 2018 midterm elections, President Donald Trump and congressional leaders agreed that advancing a long-term infrastructure measure this year has the potential of garnering bipartisan support. While Trump and Senate Republican leaders have yet to outline their policy priorities, the House Transportation and Infrastructure Committee on Feb. 7 examined funding options for a comprehensive infrastructure measure. At that hearing, policymakers reviewed a fuel tax, public-private partnerships, a vehicle-miles-traveled fee and tolling. House Transportation Chairman Peter DeFazio (D-Ore.) said he intends to unveil a measure later this year.